With speeds up to 40Gbps, the ARC-8050T3 is equipped with dual Thunderbolt 3 ports for making quick work of anything. Able to connect to any Thunderbolt 3 enabled Mac or PC host and daisy-chaining other Thunderbolt 3 devices, all while supplying power for quick notebook charging (PD pass through). The Thunderbolt daisy-chaining allows connection of up to six devices, so customers can connect ARC-8050T3 for massive amounts of video storage with a single Thunderbolt connection to their host computer. ARC-8050T3 series can meet the demand of users when working with rich, ultra-high resolution media through Thunderbolt 3 interface. The ARC-8050T3 also sports a full sized DisplayPort video output on its rear, allowing for a quick and easy 4K 60Hz display setup. 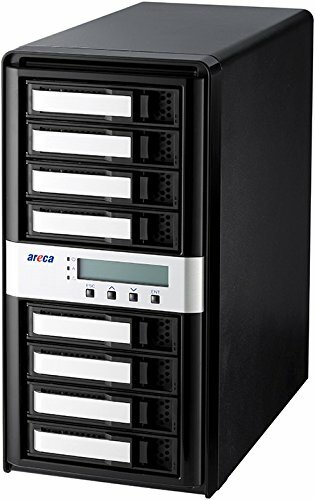 ARC-8050T3-8 is an 8 bay desktop SAS/SATA Hardware RAID Storage solution. The ARC-8050T3-8 performance is driven by an on-board RAID-On-Chip and ECC SDRAM memory to deliver true high performance hardware RAID protection against drive failure. This combination helps to provide a high performance storage device ready to take on real time multi-stream HD, 4K, 6K and 8K workflows.